Hollis and Company’s diamonds are purchased from legitimate sources, not involved in funding conflict and in total compliance with United Nations resolutions. They are of natural origin and are untreated or enhanced in any way. The Asscher Cut is a modified version of the Emerald Cut. 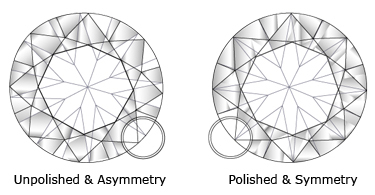 This shape is named after Joseph Asscher of Holland who was an eminent diamond cutter. In 1902, his company, Asscher Diamond Co., developed and patented the Asscher Cut, a squarer step cut with an almost octagonal outline. This new cut enhanced the fire and light of the stone; it had a small table, a high crown, wide step facets, a deep pavilion and square culet. . The human heart is the ultimate symbol of love and the Heart Cut is regarded as the most romantic of all the shapes. The Heart shaped diamond is essentially a pear-shaped diamond with a cleft at the top and it typically contains 59 facets. Due to the complexity of the shape, skilled cutting is necessary to maintain the diamond’s brilliance. Generally people prefer a heart shape diamond for sentimental purposes. This shape is mostly used in pendants, but also suitable for most jewelry items. 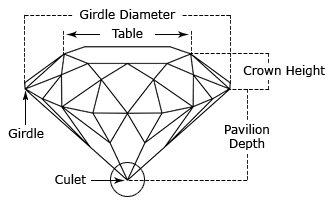 Information aboutn Diamond's Depth, Table, Girdles, Culet and Facets etc.